What’s the best way to beat the heat? Get out on the water! 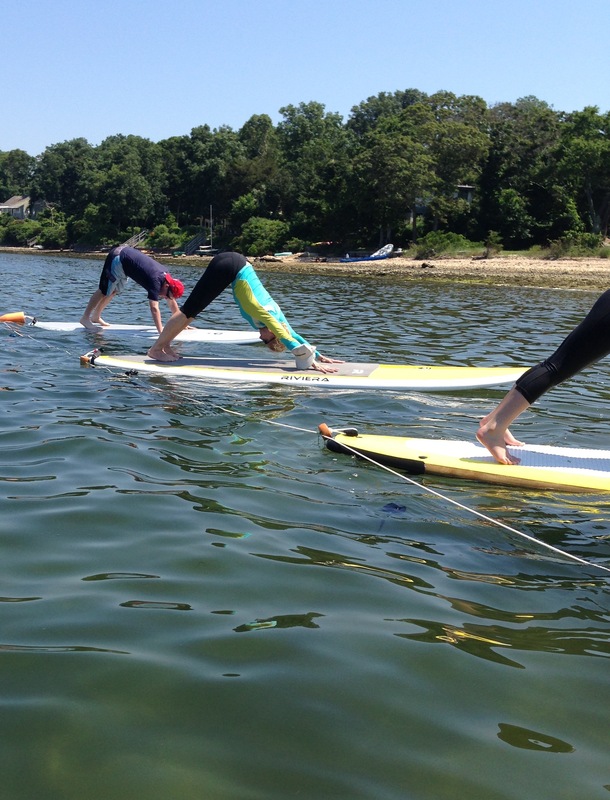 One way to do so: how about a downward facing dog…on a paddleboard?! Yup, yoga and paddleboarding are not only two of the most popular fitness activities, now they’ve become one! There were a few first-time paddlers in the group. Gina and Jessica gave a quick intro for newbies and we all headed along the channel. The thing I love most about stand up paddleboarding is that newcomers can become SUP experts in a snap. It really only takes a few minutes to get comfortable on a board, so the playing field is pretty level (though there’s no competition here.) Equally as beneficial is that SUP is a great workout everyone can appreciate, whether solo or in a group. The sport allows for casual socialization with other paddleboarders, but is also a great excuse for some alone time. When you’re paddling through the open waters with the sun shining down, (especially in the Hamptons!) there’s nothing not to love. The surroundings almost make you forget the fact that just about every muscle in your body is fired up and working hard. Stand up paddleboarding is a full-body workout, you’ll feel those arms and abs pretty immediately…I love that feeling! 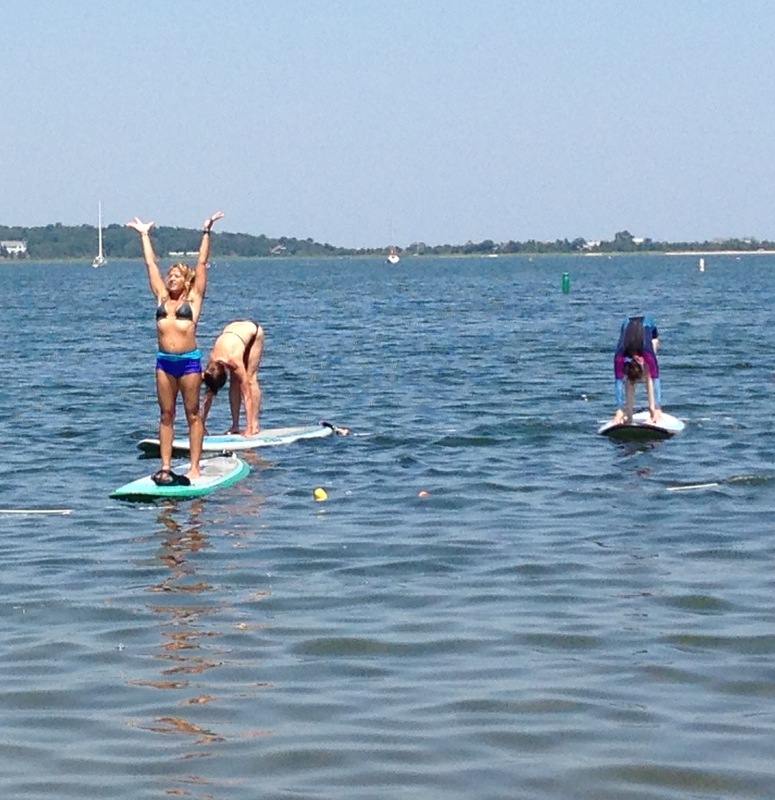 After about 30 minutes of paddling, we were all comfortable on our boards, and ready to test out some yoga. We ‘anchored’ near the shore and started off, like most yoga classes, with some seated breathing, a little chanting, and some easy stretching to get focused. We moved through downward dogs, chaturanga, and even got into some lunges and warrior poses. The more advanced poses were definitely a challenge (it’s hard enough balancing on a still mat!) but there was an added sense of peace brought on by the easy waves and hot summer sun. Jessica’s clearly a pro at teaching this complex style of yoga. She performed lots of the moves (effortlessly) and made her voice and herself available to paddleboarders facing all directions, listening for her cues. I was facing away from Jessica most of the class (not on purpose, but the yogi just goes where the board goes) and Jessica lead us through the class perfectly with simple vocal cues. She acknowledged when a pose took some extra balance and coached us through the challenge. I was far more confident than I had expected and I was eager to try each pose. Every few minutes, someone would laugh, scream, or splash!-plop right in. And, in such intense heat, that’s half the fun. We had lots of laughs, but it didn’t break the serenity of our practice. Jessica allowed the class to flow naturally, reminding us to breath, but also laughing right along with the rest of us. Her comfort and ease in the water and on the board was truly breathtaking. Her form was flawless, as if her board was indeed as still as a yoga mat. Her trust in the board and the water was palpable, it assured me to push a bit further myself. Did I mention that Jessica is 24 weeks pregnant?! She’s an inspiration, beautiful yogi, welcoming teacher, and of course, nothing less than a true paddle diva. 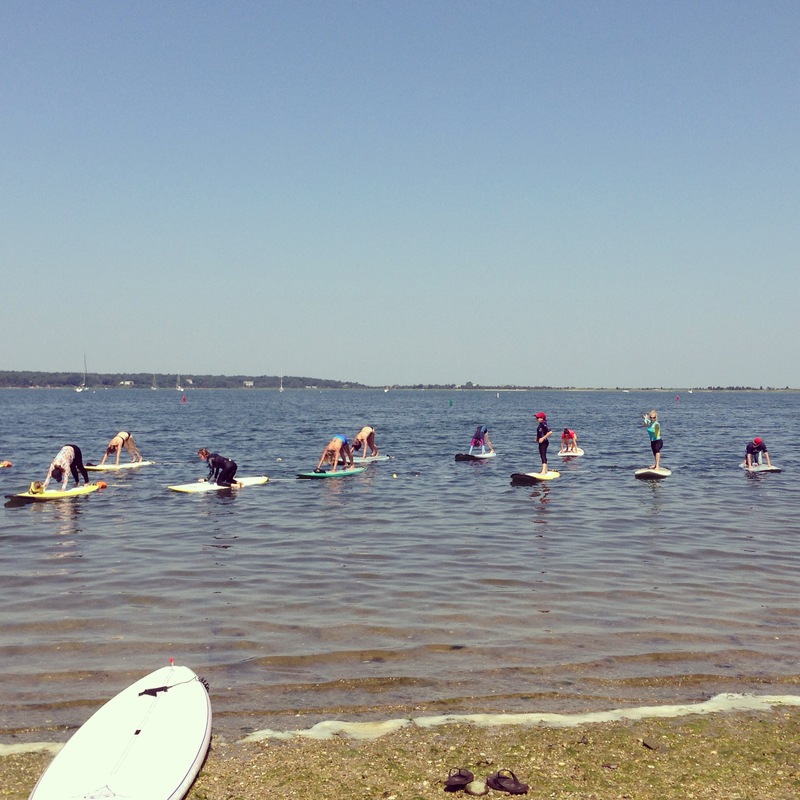 I had a great time and can’t wait to return to another SUP yoga class soon. I hope you’ll join me! I’ve said it before and I’ll say it again: try new things! Try things that scare you! Trust me, you’ll be so glad you did and may even find a new hobby! This was my second attempt at SUP Yoga and I have to say: I’m hooked. One Healthy Breakdown: Don’t choose between yoga and paddleboarding, combine the two! Get out there, get wet, and have fun!